68th Street. An electro-acoustic composition. 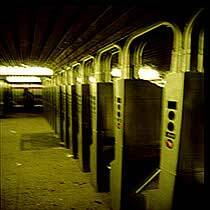 68th Street is based on one single sound recording, made in spring of 1998 in New York City. I tried to catch the unique atmosphere of a NYC subway station, especially these high, sinusoidal tones that occur when sliding a metro card through the ticket machine and the following sounds of the bouncing turnstile. During the afternoon rush hour, dozens of people enter the station at the same time and "activate" many of these sound sources. The formerly discrete and short-lasting elements merge and create a static, almost meditative environment, a continuous soundscape: what happens very fast, causes something quite slow. I especially like this situation because the turnstiles are not exactly in tune, and thus the acoustic merging of several machines leads to audible beatings, dynamic pulsations of close, but slightly detuned frequencies. I chose a five minute-long sequence from the above described sound recording, and developed a pyramid-like structure through filtering, transposing and overlapping of the material . The piece begins with a very low transposition of the recording, higher variations are added one after another, until the original version is reached. The (almost) unchanged original recording dominates the middle section of the piece, but then the descent starts again, and the composition fades out with its beginning sequence. 68th Street has been released as part of the CD relisten, Intransitive Recordings, USA, in October 2001.